Major cocaine seizures in Spain, Portugal and Ecuador illustrate the European cocaine pipeline that has become a central part of the operations of Colombian drug traffickers, and could represent lucrative new opportunities for them to move further up the drug supply chain. On Jan. 17, Spanish and Portuguese police announced the seizure 745 kilograms of cocaine during the course of an operation against an international drug trafficking ring operating in both countries. Press reports indicated the network was led by Colombian nationals. The group allegedly imported Colombian cocaine in shipping containers traveling from Panama to Portugal, and were in the process of trying to import 355 kilograms of cocaine stashed in hollowed-out pineapples. According to police, the network transported the drugs to a stash house in Barcelona, and then on to several properties in Madrid, which were used as “laboratories,” presumably to cut the cocaine, and distribution points for sales within the city. Police arrested nine people, among them at least three Colombians and a Venezuelan, with two Colombian brothers named as the alleged ringleaders. They also seized 400,000 euros ($490,000), two hydraulic presses, precision scales, three packaging machines and documentation related to fruit import companies, reported Catalonian newspaper La Vanguardia. 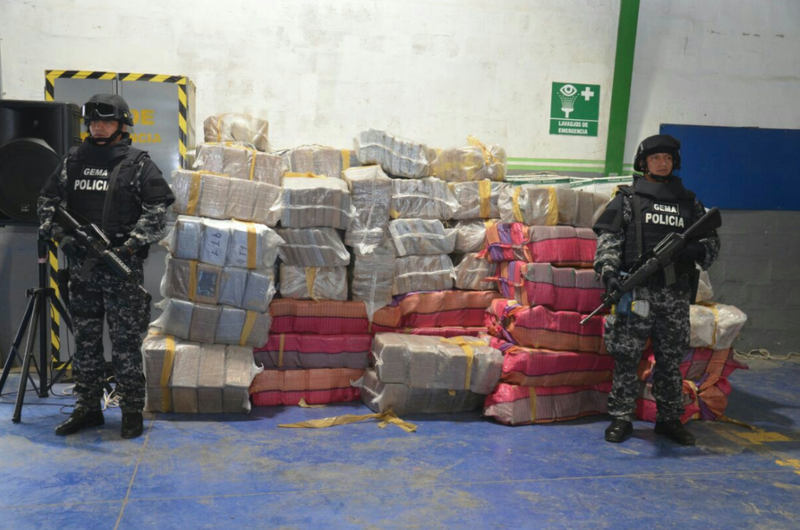 In Ecuador, meanwhile, the Interior Ministry announced the seizure of 1.45 metric tons of cocaine hidden in a shipping container of frozen fish that was set to sail from the port of Guayaquil to Belgium. 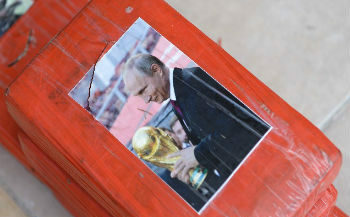 According to the police, the drugs came from Colombia and comprised shipments from three different trafficking networks, with the packages marked with different images — some of Russian President Vladimir Putin, others of a chainsaw, and others of a bull. Ecuadorean news outlet El Telégrafo reported that police have so far arrested just one person in connection with the seizure: the customs agent who completed the shipment’s paperwork. When it comes to the world’s largest cocaine market, today’s Colombian drug trafficking networks have been reduced to the role of wholesalers to Mexican cartels, who claim the biggest profits by controlling the movement of drugs into the United States, as well as wholesale distribution there. However, in recent years, Colombian networks have been gradually making up for this shortfall in high-end drug trade profits by seeking out other markets — Europe in particular. Although more distant from drug production centers, Europe offers major advantages compared to the United States: there is less risk of interdiction, there is little interest in extraditing Colombian traffickers, and the price per kilogram is substantially higher. The seizures highlight two important routes Colombian cocaine takes to Europe. Cocaine produced in southern departments of Colombia such as Putumayo, Nariño and Caquetá frequently crosses the border into Ecuador, where it is dispatched from ports, above all Guayaquil, where anti-narcotics police seized 13.5 tons of cocaine last year, according to Ecuador’s El Diario. Cocaine produced in the north or on the Pacific coast, meanwhile, is often first trafficked by land or sea into Panama, and then onto Europe in shipping containers. 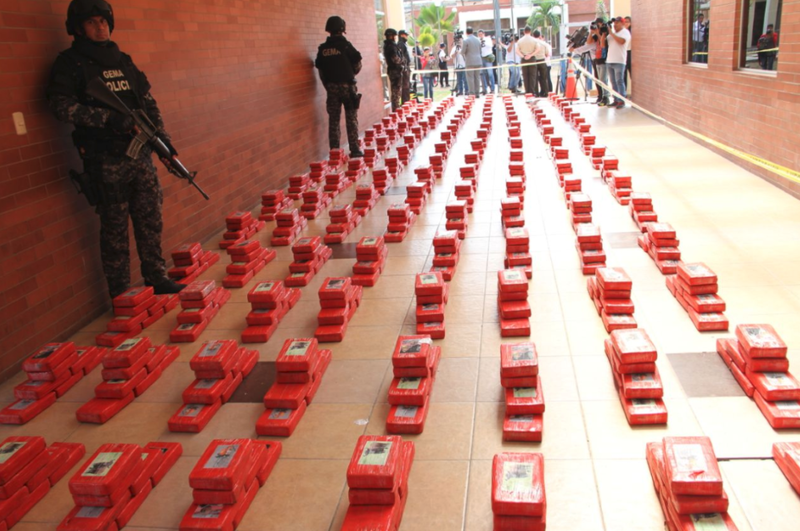 The seizures also fit a pattern of a substantial increase in the size of shipments reaching Europe that coincides with the dramatic increase in cocaine production in Colombia. As InSight Crime reported last year, officials across the continent registered a sudden leap in the average seizure size beginning in mid-2016, with officials in Belgium, for example, noting an increase from an average of around 100 kilograms to up to 600. However, the most notable aspect of the recent seizures was the Colombian-led network’s operations in Spain, which involved not only importing cocaine into Europe, but also breaking down shipments and distributing it within major cities, in this case Madrid. This contrasts with the more common pattern of Colombian traffickers importing cocaine and then handing it over to European organized crime networks, in particular the Italian mafia network the ‘Ndrangheta, for distribution. Although the network appears to have been limited to distribution in Spain, it poses an important question regarding Colombian operations in Europe. How far up the chain will the Colombians seek to progress? While the safest and easiest option is to hand over to European networks at the continental entry points, huge profits can be made by breaking down loads and distributing them into different countries. Within Europe, price differentials can be massive. For example, the short hop from the Netherlands to the United Kingdom can increase profits by over 60 percent per kilogram. Even within the European Union’s Schengen zone, which can be crossed without having to move through any manned borders, prices can increase by around 40 percent. Several factors could facilitate attempts by Colombian groups to move into intra-continental distribution. Firstly, Colombians groups such as the Rastrojos and later the Urabeños have a level of armed presence in Europe, maintaining “oficinas de cobro,” or debt collection offices, in Spain, which have been linked to kidnappings and murders. Secondly, the abolition of visa requirements for Colombians to enter the Schengen zone, makes entering and operating in Europe substantially easier. For sure, there are limits to any expansions the Colombians might undertake as they would be unlikely to move into territory where distribution networks are run by established and powerful organized crime structures as such the Italian and Russian mafias. Nevertheless, this still leaves an array of potentially lucrative territories that would take their already high European profits to new heights.